With my work, there are times that I am on the road a lot. For example, in the last 8 days I have been on 7 airplanes, checked into 3 hotels, and rented 4 rental cars. If anyone needs tools to keep their trips organized, I do. Here at WMExperts, we have found that Spb has earned a great deal of respect for their products in the past. So when I saw Spb Traveler , I knew I was the going to be the perfect person to put this through the test. Most WM software travel packages offer a collection of tools. The question then becomes are the tools useful for me and how comprehensive are they. If you travel abroad, this might be a handy tool to have, especially if you have to find a bathroom really fast, you can ask anyone in 12 different languages. In each language it has a fairly comprehensive list of the most common words / phrases / questions you would need to know. You can even filter by category like Apologies, Introductions, Gratitude, or First Need Phrases. I have to say I was impressed with how comprehensive it is and how thoughtfully this tool was laid out. This is the main tool that I was very interested in. With the Trip Assistant, you can organize all of your travel arrangements by saving them per trip. 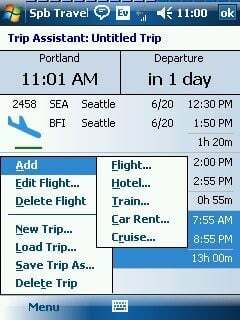 So it can organize your flight, hotel, train, car rental, and cruise information for each trip you take. The Trip Assistant will then automatically enter your trip itinerary as appointments into your calendar, which is very handy. The only thing that I found a little disappointing is the lack real time data integration. I would love it if I could just enter in the flight number, date, and airlines and then it finds and imports the airports, exact times, etc. from the internet. When you look at the details for each flight there is a link at the bottom to check the status of your upcoming flight. 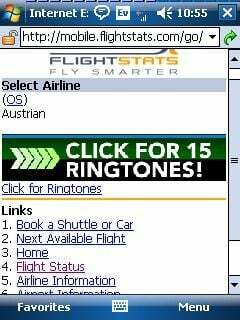 Though it is a handy link to have, I was disappointed that it only pointed me to a website where I had to reenter the flight number to search for the flight status. I would have hoped that Trip Assistant could have done that for me and simply showed me the flight status automatically. But if you have enter each part of your trip into your calendar anyway, this is a handy way to do so in an organized fashion, while prompting you for all the useful information you don't want to forget to put into your calendar. The weather forecast is fairly standard, but convenient to have right next to the Trip Assistant. I like the fact that it gives you the weather for each part of the day, as temperatures and weather can be drastically different from the morning and the late afternoon, which can make it easier to help you plan your day. If you ever have to call anyone in Europe from the states, I am sure the person who you are calling would appreciate it if you didn't call them at 4:00 am in the morning their time. To help you avoid this, you will find World Time tool to be very helpful and informative with just a glance. 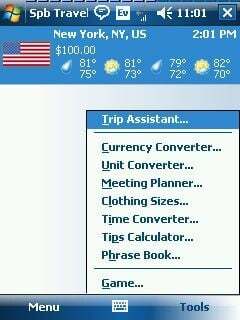 If you often times have to travel outside of the United States, even if it is just to Canada or Mexico, you will find the Currency Converter to be invaluable. It does pull the most recent exchange rates from the internet, so you will always know what the latest exchange rates actually are. These are two separate tools that help you convert what ever measurement you think of in to what the common measurement is, no matter what country are in. For example, if you see that it is going to be 29 degrees Celsius, do you need to bring a coat? Or if you need to buy a pair of shoes in Europe, what size is equal to the US Men's size 9 1/2? Have you tried to figure out what tip to pay when trying to split it 5 ways?... Or simply want to make sure that you are not short changing the waiter that gave you really good service? 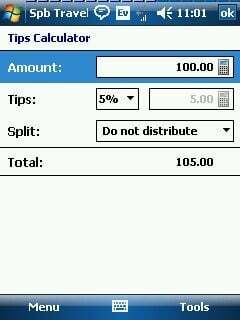 Or since you will have to expense your meal with your corp office, you want to make sure that you do not overtip... you will find the Tip Calculator a useful tool. These are two separate tools that work well as a team. It is often times challenging to schedule meetings with several people in different time zones, or in a time zone that you will be traveling to at a later time. These two tools will be able to you manage both situations. The Meeting Planner will actually enter the appointment into your calendar as well. Spb Traveler offers a few additional features as well. There is the Spb Traveler main page. You can add as many cities as you want to on this page. 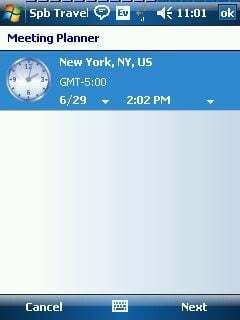 You can see all the local times, weather, and currency exchange at a glance for all the cities. 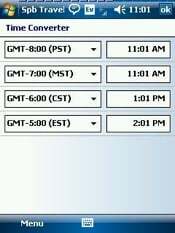 Then when you click on a city, you will get the details of that area, including local area codes, standard tip percentage, local sunrise / sunset, etc. There is also the Today Page plugin. This gives you the weather of any city you have added to your main screen in Spb Traveler. You can also configure how it looks and how big it is on your Today Page. Overall, it is a very handy application to have if you do any traveling at all. 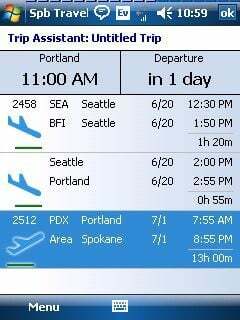 Just forget your printed itinerary once, or try to remember all of your connecting flights on a long trip, and this program will more than pay for itself with the peace of mind it will give you during your travels. If you travel exclusively abroad, or never leave the US, it has many tools that you will find very handy to have with you. My only wish is to have more real time data importing from the Internet with the Trip Assistant. Other than that, Sbp has released yet another solid software package.